I love old comics! I especially love old advertisements. Maybe it’s nostalgia, maybe it’s my marketing background, or maybe I’m just getting old. Regardless, I love seeing old ads for upcoming comics! While reading a particular batch of old DC Comics, I was surprised at how many great titles were launched in 1987. Seriously, it was a great year for new books at DC! The Crisis had given DC a new starting point for lots of titles and they were just coming off the successful Legends mini-series. This week we’ll be looking at some of those old advertisements for DC Comics that began their run in 1987. Today we’ll be looking at some Keith Giffen books from that year. Below you’ll find the ad for Justice League #1. This title changed the team forever! If you’ve been reading ONCE UPON A GEEK for a while, then you probably already know that I’m a big fan of this era. 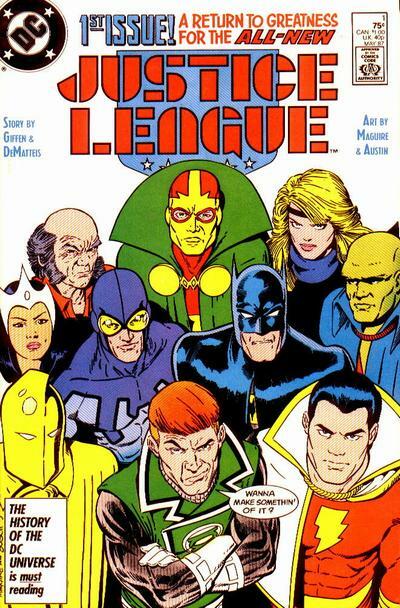 In case you’re confused by the name changes, the series started as Justice League (#1-6), then became Justice League International (#7-25), and then changed again to Justice League America (#26-113). Here is the cover to Justice League #1. Not that different from the ad really, but still fun to look at. This series launched in February 1987. Next up is Dr. Fate, a four issue mini-series that redefined the good Doctor. DeMatteis did the writing chores on this one while Giffen pencilled the book. 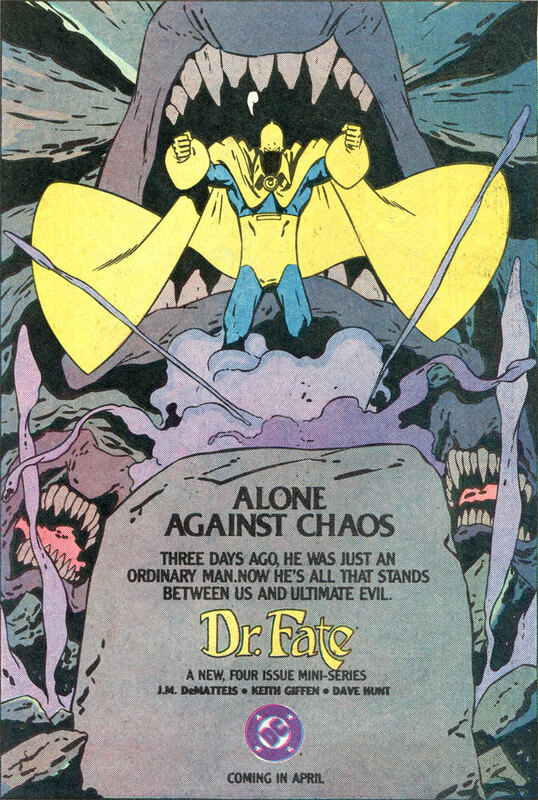 Again, if you’ve been reading this blog for a while, then you know I love me some Doctor Fate. This series was a real shocker to long-time fans. It was revealed that Doctor Fate was always intended to be a male and female joined as a composite being, but the magical entity living inside the helmet (Nabu) had prevented it. Eric Strauss (aged to an adult by Nabu’s magic) and his step-mother Linda assumed the role as the new Doctor Fate. 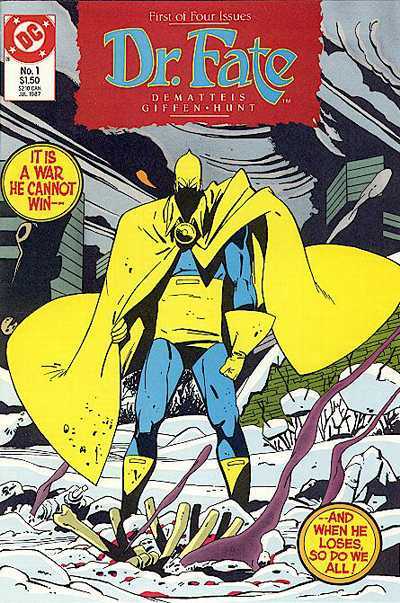 This led into the ongoing Doctor Fate series that started in 1988. Here is the cover to Dr. Fate #1. A little different from the ad, and a little more gross. This mini-series launched in April 1987. 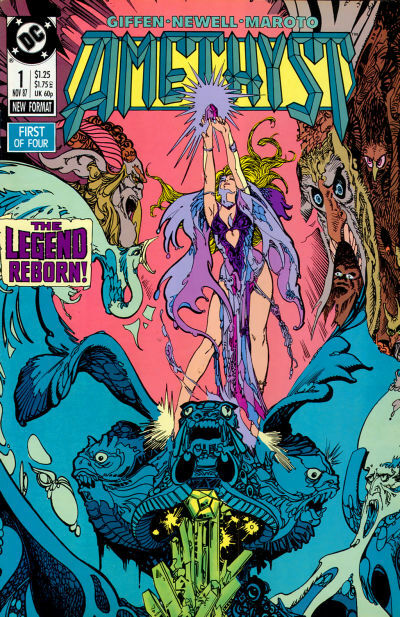 The last Giffen series for today is the Amethyst four issue mini-series. This wasn’t Giffen’s first association with the character. Both he and Mindy Newell had worked on the previous ongoing series in 1986. The artist for this mini-series was the breathtaking Esteban Maroto. This guy draws fantasy-based comics like no one else. His work is gorgeous! I never read this series and I’ve heard mixed reviews of it, however, I felt it deserved mention here. And besides, any chance to show off Maroto’s artwork is fine with me. Here is the cover to Amethyst #1. Another beautiful Maroto piece. This mini-series launched in August 1987. Didn’t DC do an ad for Amythest at some point which had copy along the lines “Its not just a title you let your little sister read while you read Batman” or something? Luke – It’s quite possible, but I don’t recall specifically. Does anyone else? 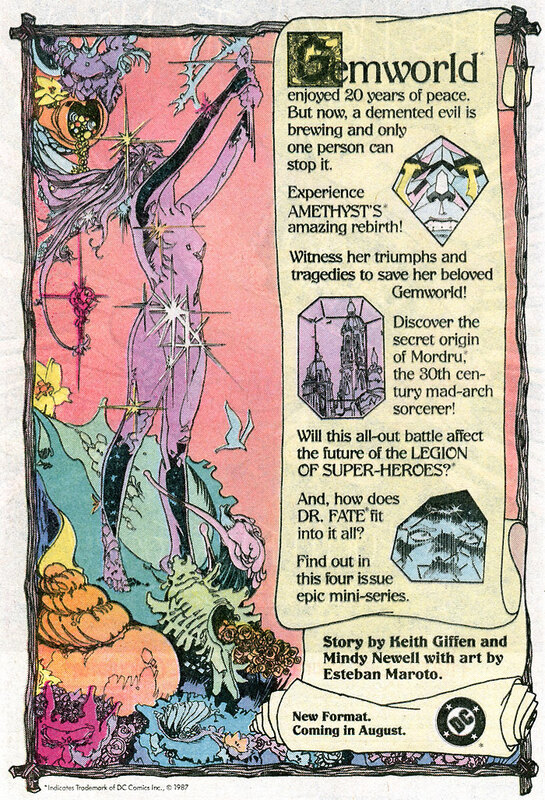 I know there were several Amethyst series – the original 12 issue mini-series, an annual, a 16 issue ongoing series, a special, and finally this four issues mini-series. They certainly kept trying. From what I understand, the best stuff was by Mishkin and Cohn. Hey, is this another website of yours??? IT is SO dang cool here! My boys will love it. We love old comics,especially the ads in the back. There is a store in the next town, and we love to go in and pick something up. NOthing too expensive, but for 3 or 5 bucks, we get something we all love and add to our collection. I think the lineup to Justice League is pretty interesting. 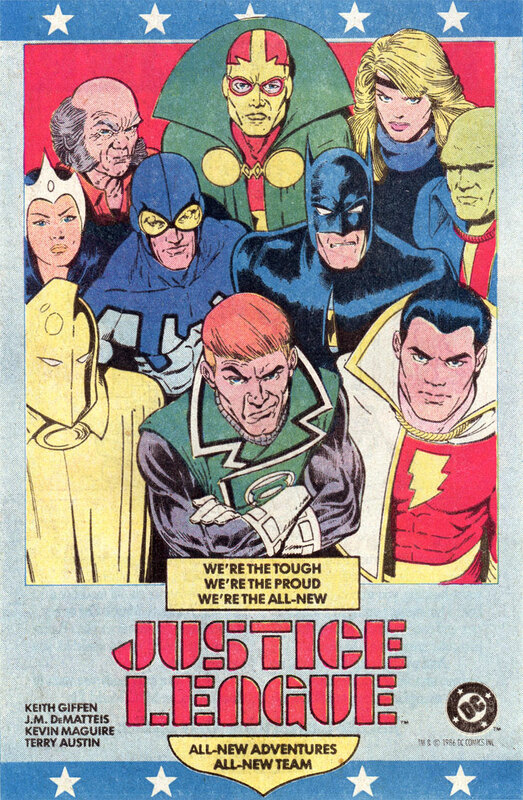 It looks like they were trying to make sure that they had representation from all of the major Pre-Crisis Earths. I’m not sure if that was the idea or not, but it sure seems like it was. I’ve never read a comic book and I enjoy the movies they’ve been making lately, Iron Man and the like. My lack of knowledge about the original stories probably helps my enjoyment. Of course I am addicted to all things Superman. These ads are really cool just the same. I could see them decorating a game room or something. I’ve got to say, Gemworld is really SUPER gay!